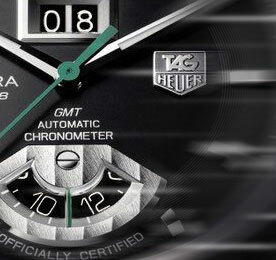 The dial of the Tag Heuer CAV511C.FT6016 Grand Carerra Titanium watch may remind you of a speedometer. The Tag Heuer brand of watches often tries to balance sport look and functionality with the class and style of a classic, luxury watch. For the most part, their products pull this off, but sometimes you may just want a sport watch. The Tag Heuer Men’s CAV511C.FT6016 Grand Carrera Titanium Automatic features many of the trademarks of a sport watch, including multiple facets to do its dial and bezel, and the durability of a rubber strap. The question then may be how much does the Tag Heuer name mean to you as a watch buyer if you no longer want the luxurious tones? When it comes to functionality, the Grand Carrera Titanium Automatic features a tachymeter on the bezel, a date of the month on the bottom side of the dial at the 6 o’clock position and two other sub-dials to the right and left side of the face of the watch features a 60 second and 60 minute counter. The titanium bezel and rubber strap respond to the durability demands of an active person and the standards of a sport watch. The rest of the composition of the watch features a synthetic-sapphire window covering for the dial and a stainless-steel case. You may prefer a true sapphire window in your watch as they tend to be more reliable than the synthetic variation. The rubber of the strap has a sporty perforated look and the watch is water resistant to 100 meters. Two sub-dials for seconds and minutes. Tag Heuer wants their Grand Carerra watches driven fast. The problem with Tag Heuer Men’s CAV511C.FT6016 may be with how one justifies choosing this watch over any other sports watch. If you are simply looking for the function of a sports watch then there are many other options at lower price ranges and those you may find to be of better quality parts or be able to boast a greater dive depth. 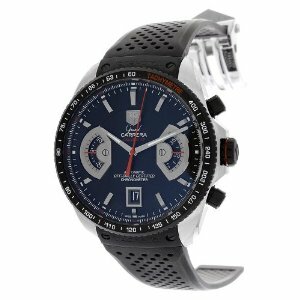 The issue with the Grand Carrera Titanium Automatic may be that isn’t exceptional as a sports watch or as a Tag Heuer product. It is somewhat less cluttered than many sport watches, but still remains cluttered in dial appearance. In that manner, it doesn’t scream luxury at the level you may want. It is instead a Tag Heuer sport watch, with rubber straps, a busy dial and automatic movement. If any of those things listed excite you then you may want the watch, but it is hard to see those as convincing arguments.